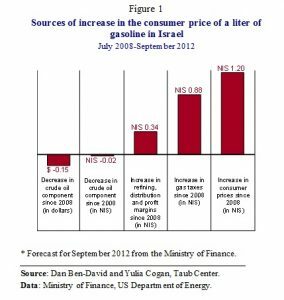 A study by Taub Center Executive Director, Dan Ben-David, shows that gasoline prices in Israel are higher than in most Western countries, primarily because of high Israeli taxes. The tax on a liter of Israeli gasoline exceeds the entire gas pump price of the same liter in the US. In the beginning of September, Israel’s government-regulated gasoline prices spiked up to 8.25 shekels a liter (roughly $8.00 per gallon of gasoline). The government blamed spiraling crude oil prices. A new study by Prof. Dan Ben-David, Executive Director of the Taub Center, which appears in the Taub Center’s upcoming State of the Nation Report 2011-2012, finds this claim misleading at best. In July 2008, a liter of gasoline in Israel cost 7.00 shekels, or 1.25 shekels less than in September 2012. As Figure 1 shows, the crude oil component of a liter of gasoline in shekels was practically identical in both years (actually, 2 agurot less in 2012); so the price of crude oil is clearly not the culprit. On the other hand, the tax component of a liter of gasoline rose by 0.88 shekels, comprising the bulk of the price increase to the Israeli consumer. Gasoline taxes are popular worldwide due to their many advantages: they are easy to collect, hard to evade and may also discourage excessive automobile use and thus can help reduce pollution, road congestion and traffic accidents. But a gas tax also has unique disadvantages: it is highly regressive, affecting above all the working middle class, and it compromises the competitiveness of key sectors of the economy including transport and shipping. Policy has to strike the right balance between these considerations. This new study by Ben-David finds extensive evidence that the balance in Israel has been upset in recent years. One indication is found in Figure 2. 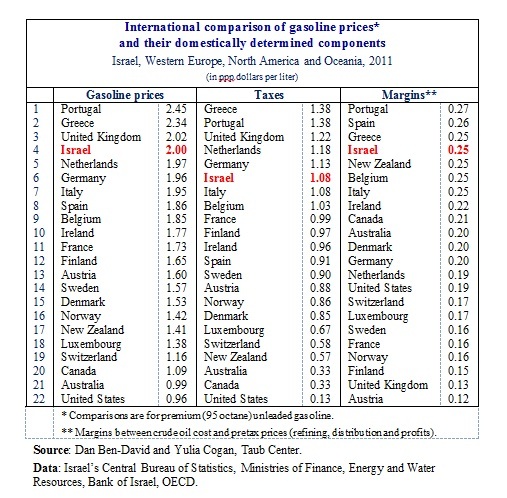 It shows the relative contribution of crude oil prices, refining and distribution costs, and taxes to the prices actually paid by Israeli consumers. If concerns for the economy and for taxpayers were a high priority, then it might be expected that taxes would fall in times when crude oil prices spiral upwards, or at times when the economy is weak. When crude oil prices are high then taxes are less important in discouraging excessive use, and the burden on the Israeli consumer and producer is higher; taxes can provide some slack. Likewise, when the economy is weak, one way of stimulating economic activity and providing relief to consumers is to reduce the tax on gas. Yet, as crude prices have risen and the world economy has weakened over the past decade, Israeli taxes have actually increased. One reason is that the excise tax is higher today (in real terms, i.e. after inflation) than it was in the past. Another reason is that a value added tax (which is imposed not only on the gasoline, but also on the excise tax) rises automatically when crude prices go up. This finding lends credence to the impression that revenue considerations have dominated all other important policy goals. One useful barometer for examining the excessiveness of a policy is to examine what is done in other countries. After all, Israel is not the only country facing the policy dilemmas described above. Part of the story is told by the table. Of the 21 other advanced countries surveyed, 18 have lower gasoline prices than Israel. The largest component in the price of Israeli gasoline is taxes, which are over 50 percent greater than the crude oil component. Israeli taxes are the sixth highest among the 22 countries in the table. 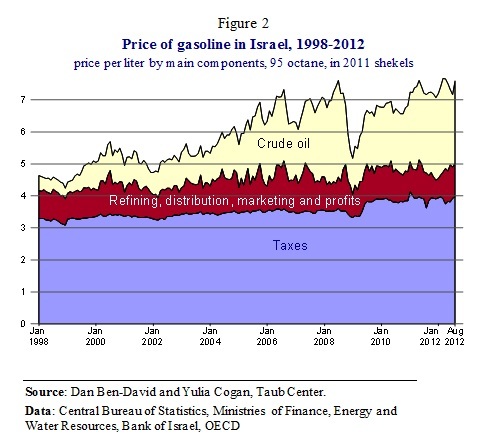 Not only are Israeli taxes relatively high, so are the margins between the cost of crude oil and the pre-tax price of gasoline – that is, the margin that covers the costs of refining, distribution, marketing, and profits. The margins are higher in Israel than those in 18 of the 21 other OECD countries. 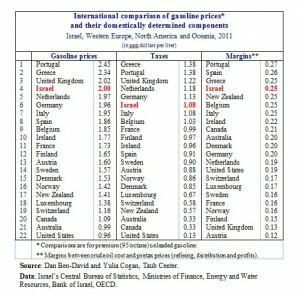 The actual burden of expensive gasoline is highly dependent on the standard of living in a country. The Taub Center study finds that when accounting for income differences among these countries, the average OECD tax on gasoline was 35 percent below the Israeli tax, with 19 of the 21 countries exhibiting lower taxes relative to incomes than Israel. The impact of substantially increasing transportation costs for consumers and industry in Israel is exacerbated by the lack of adequate transportation alternatives to the car. Traffic congestion in Israel is two and a half times the Western average; the country’s rail alternatives are inadequate after languishing for decades as resources were diverted elsewhere. Even the recent surge in road construction reflects expenditures relative to GDP at a level that other countries spend primarily on maintenance, which is insufficient to close the gaps that have widened over time. Whether the research spotlight is turned on Israel alone or on a comparison of Israel with other comparably developed countries, it seems that Israel would benefit from a reexamination of the way it taxes gasoline and the way it incentivizes competitiveness and efficiency in the local refining and distribution sectors.